Motorcycle riding is one of the most exciting experiences in life. The adrenaline, the speed, the sheer feeling of air rushing as the scenery blurs by, it’s utterly addictive. 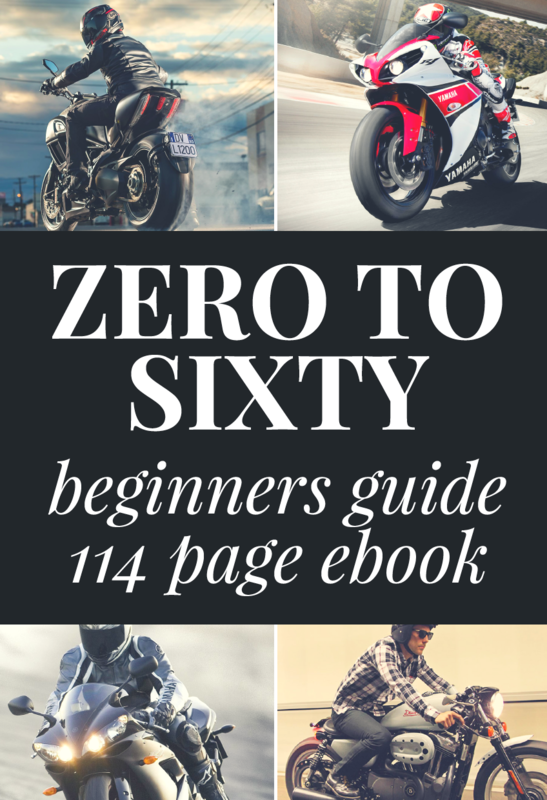 It is easy to see how with all this excitement in the air first time motorcycle riders spend all their money on their ride and neglect to invest in safety equipment. The bottom line is that you will fall, you will have an accident at some point and you need to protect yourself. When it comes to buying riding gear, no piece of equipment is more important than a good motorcycle helmet. A helmet not only protects the rider from head injuries, but also provide an insulating cover from wind and dust that comes along with the wind. Choosing a motorcycle helmet can be as difficult as choosing the right motorcycle so we put together the Ultimate Buyer’s Guide to Motorcycle Helmets and our readers tell all the time it was really helpful in their helmet decision making process. 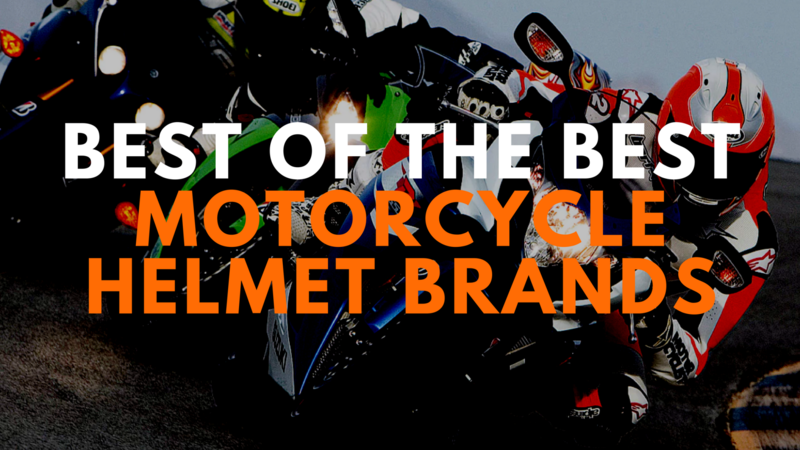 The other question we get all the time (and that’s the focus of this post) is which Motorcycle Helmet brand is the best. With so many helmet brands on the market, it is hard for people to make the right selection and to do the appropriate research, especially if you are a beginner motorcycle rider. Some helmet brands offer the basic functionality of just protecting the head, using average quality materials and really cheap price points. On the other hand, there are some premium brands that protect your head, offer complete comfort to riders, have huge feature lists and exotic materials that would impress NASA. 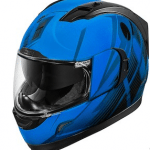 Helmet manufacturing companies offer an extensive range of helmets that include motor cross and modular helmets, open face helmets, half face & full face helmets. We dive into the best helmet brands and let you know which is best. Riders who ride sports bikes love Bell helmets, not because they look super-cool, but they provide them optimum protection for reasonable money. Sports bikes are all about looks and speed so it is important for bikers to protect their heads with helmets that are reliable and efficient at speed while looking good and having solid ventilation. We love Bell helmets. They are made up of top quality materials, have nice touches and features that cover a lot of ground. Moreover, they have an unrivaled ventilation system. The company has incorporated an exclusive velocity flow ventilation system in its helmets that come with the flow adjust. The proper air management system provides users with a comfortable and cool experience throughout the journey. Overall, Bell helmets are pretty great for day-to-day use. Let us take a look at the advantages and disadvantages of the brand. Bell makes one of the best motorcycle helmets. Bell has great variety of designs that suits all riding and style types. Good for both beginner and experienced riders. The company makes dedicated helmets for women as well. Bike riders can wear the helmets for off-road tracks and everyday ride. Good warranty with all its helmets. Most helmets are DOT and SNELL certified. Padding can be a little cheap (or non existent) in some helmets. Quality is not as high as some of the more premium brands. Sound protection is weak on most Bell helmets. Bell is a brand that has broad appeal amongst new and experienced riders across all riding types and style. They have a great range of helmets that look great, have solid features and are DOT and SNELL certified. They do this while maintaining a reasonable price point that most riders can afford. Overall, a great motorcycle helmet brand we highly recommend. BestBeginnerMotorcycles has worked closely with RevZilla over the years to provide our testers with products to review. In addition to being a great site to shop from, they’re also a great partner. Both Amazon and Revzilla have a big selection of Bell helmets. Please note that we may get a commission if you end up purchasing through links on this page. Classic looks with modern technology. Thats the best way to describe the Bell Bullitt Helmet range. Developed as part of Bell’s 60th anniversary celebration, the Bell Bullitt looks like the original helmet that came to define the brand in the early days. Modern technology includes intake and exhaust vents that work great in our testing, top notch safety certification and an ultra low-profile composite shell. If you want to look cool and classic with all of today’s top features, this is the helmet for you. Check out all the styles. The core technologies used in the Bell Star range is staggering. Things like a Flex Impact liner which is first-of-its kind, three-layer impact liner designed to manage energy from three potential impact scenarios: low, mid and high-speed. It has a mix of Aramid, carbon fiber, and fiberglass for the shell and innovative tech like a power mesh liner technology designed for better cooling. This is some serious race helmet tech and they look awesome too. Just when you thought the Bullitt Helmets looked all old school, the Custom 500 range comes alone and goes all prehistoric on you. Nothing beats an original. Back in 1954 Bell founder Roy Richter formed his first helmet out of fiberglass and named it the “500.” Bell’s Custom 500 pays homage to Richter’s original design while adding modern protective technology the Bell Custom 500 is DOT approved. Some cool colors and styles available in the base range and you should also look out for cool new special editions launched every season. You also can’t beat the price point. If you’re riding long distances and touring is your bread and butter, this is the helmet for you. Designed to easily accommodate the Bell-specific Sena SMH10 Bluetooth® stereo headset and intercom the ultra-comfortable and versatile Mag-9 redefines the open face helmet category. We’ve tested the bluetooth functionality and loved it. For the connected rider everywhere. Bell is the offroad helmet king and they continue to innovate. Their Moto-9 Flex helmet is one of the most advanced helmet made for offroad use. According to Bell is it “designed to manage linear and rotational energy to the head in certain low, mid, and high-speed impacts”. The Moto-9 Flex is quickly setting a new level for rider protection in motocross and off-road racing. We’re also big fans of the MX-9 dirt helmets which now come with MIPS (stands for Multi-directional Impact Protection System, which is a leading slip-plane technology inside the helmet). From the first time you put the Pit Boss helmet on, you can feel the difference. The ultra-light TriMatrix construction keeps weight to a minimum while still passing tough DOT standards. Also featuring Bell’s innovative Speed Dial fit system it is a very practical helmet that is so simple to use we wonder why other makers don’t adopt this tech. It is one of the most feature-packed half helmets on the market. Lightweight, cool looking and practical – a solid all around choice. Technically this is an entry level helmet but you would never know it with the technology crammed in. In our tests the Qualifier series of helmets performed better than helmets almost three times the price. Truly remarkable. Standard features include quick-release anti-fog faceshield, Moisture-Wicking, removable/washable interior, wind collar for noise reduction, and removable antibacterial interior. We love that the helmets accommodate the Bell Sena SMH10 and Cardo Scala Rider Q1/Q3 Bluetooth® stereo headset and intercom. There are loads of designs and colors to choose from so check out the full range. 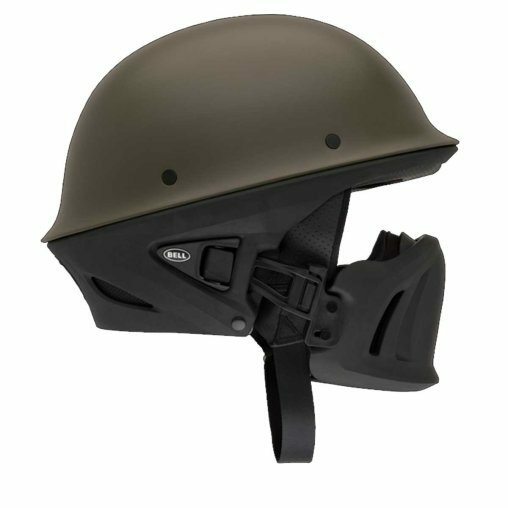 The Bell Revolver EVO Modular Helmet is an upgraded version of the best selling Bell Revolver. The Revolver EVO flip-up helmet is a high quality price point modular helmet, a bargain at ~$200. For riders looking for the convenience of a modular helmet without the premium price tag, the Bell Revolver EVO is an excellent choice. The perfect helmet for your newly started motorcycle gang lifestyle. While this isn’t the safest helmet style around, it looks cool and has enough features that we’re ok recommending it. It is really a cafe bike or vintage style helmet that is really popular these days, having gained cult status. The Bell Vortex Helmet is one of Bell’s newest full face helmets. The Bell Vortex Helmet offers a feature-rich lid at a price tag not to be argued with. Combining an optimized Velocity Flow Ventilation system, fully-removable and washable interior and a simple tool-free face shield swap nets a helmet perfectly suited for daily use, no matter what the day brings. The Bell Vortex is a beautifully made helmet with outstanding ventilation and a best-in-class face shield system. There’s no doubt in our mind that you simply won’t get more helmet for the money. It meets the DOT safety standard (of course) and it’s Snell approved. 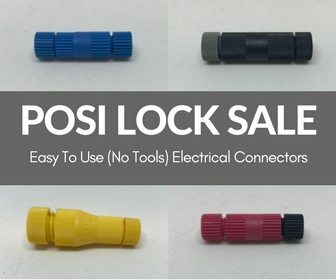 It has the high-end Bell “Micro-lock” face shield ratcheting system, which is one of the best in the business.